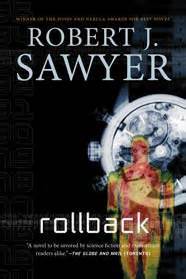 I picked up Rollback by Robert J. Sawyer about a year ago at a library sale–well, at my library sale, where I reign as Book Sale Queen, which means I paid a measly amount for it as part of my $5 per bag haul. We always do the bag sale the last hour, but because I volunteer, I just stash my book pile all through the sale instead of waiting until the last hour. Perks! Anyway, it took me forever to get around to reading this, because it wasn’t a library book and therefore not demanding my attention right away. But I read it a couple of months ago and it was wonderful. Very entertaining, and there was nothing I had to gloss over to enjoy it, i.e., sexist portrayals of women. I was fascinated by the idea: rolling back your physical age several decades. In the world of the book, only the super-rich can afford the procedure, but an interested gazillionaire offers it to an important scientist. This scientist, Dr. Sarah Halifax, is famous for being the person who decoded our first ever radio transmission from aliens. When a second message is received, she is already eighty-seven, and interested parties want her around to keep deciphering, and figuring out what to send back to the aliens to continue the exchange. Dr. Halifax is happily married, and only accepts the offer of a rollback on the condition that her husband Don can have it as well. Tragically, after both of them receive the procedure, it doesn’t work for her, only for her husband. Ironically, it may have something to do with the treatment that saved her life decades earlier when she had breast cancer. I guess I’m finding that the sci-fi I really like has a world that is almost like the real world, with just a few tweaks to make it really interesting. (I’m a lifelong Star Trek fan, so that should tell you something–I’m not going to say what; you draw your own conclusions.) You don’t have to change much to create some really interesting questions. “But still, why is abortion a moral issue? I mean, it is for people here because we believe at some point that a soul enters the body; we just can’t all agree on what that point is. But the alien message made no mention of souls. I love Sawyer’s descriptions of the relationships, and the conversations are genuinely interesting and don’t feel like set pieces. His science holds up as well, as he explains complex ideas in terms I, the reader, can understand. I loved his take on quantum physics “‘not as the basic nature of reality, but rather as the–how would you put it?–as a by-product of the level of resolution of our simulated world. '” Sorry if I lost you there, I do have a physics background. But really, I don’t think you need one to get this, at least, in context you don’t, as Sarah explains it to her non-scientific BBC journalist husband. Overall, I gave this book 5/5 stars. It’s engaging on so many levels. Has anyone out there got any Robert J. Sawyer favorites? What of his should I read next?